As he did at the Wankhede Stadium last week, Rahul Dravid stamped his class on the Ranji Trophy with another century. This time his team was not trailing and the opposition, Himachal Pradesh, was weaker but the temperament was the same on a slow and dry Chinnaswamy Stadium pitch. Dravid's innings was flanked by two contrasting half-centuries, from opener KB Pawan and C Raghu, and at the end of the day Karnataka had 271 for 4 on the board. For the first 31 minutes of Karnataka's innings Dravid sat in the far right corner of the dressing room, eyes fixed on the proceedings in the centre. The younger players sat a few rows away, chatting among themselves as Dravid shared a few words with Anil Kumble, the captain, and the coach Vijay Bhardwaj. As soon as Barrington Rowland slashed a poor drive into the wicketkeeper's gloves in the eighth over, Dravid got up, gathered his helmet and gloves, and strode out. Having played much of his first-class cricket at his home venue, Dravid knew this surface, even though it's been relaid. The feet moved, the head was still, the weight balanced. The distinct sound of ball middled on bat reverberated around the empty stadium and Dravid was away. Not once was he beaten all day, and the one instance he got into his shot early, against Ashok Thakur, the left-arm medium-pacer, he shook his head and walked to square leg. Dravid's first four boundaries, all against the quicker bowlers, were back-foot elegance: with the first he rolled the wrists late and hard to cut through gully, and with the next three he shifted the weight to push through the covers. He was especially good off his pads, shuffling across to off and tucking the spinners into the gap at short fine leg and square leg. What stood out was his mood to dominate. He made the major contribution to the 50-run second-wicket stand with Pawan, and raised it with a six over long-on off Sarandeep Singh, the former India offspinner. Eight minutes before lunch Dravid brought up his half-century with a second six, again off Sarandeep, over the same boundary. On the last ball of what he thought was the final over before the interval he slammed a four over mid-on, tucked his bat under his left arm, and headed straight for the dressing room. The umpires had one more over in mind, though, and soon Karnataka's hundred was raised. During the break Dravid was visibly relaxed, talking to his team-mates and spending a few moments with his family. Break over, he went out and resumed his role, slamming another six over long-on, this time off left-arm spinner Vishal Bhatia. Pawan, who reprised his first-innings fifty against Mumbai with a measured 56, hit a fine straight drive off Thakur and brought up his fifty with a cover-drive for four. It took 155 balls and Pawan received a congratulatory pat on the back from his senior partner. How much Karnataka's youngsters have to gain by batting with Dravid is palpable. Against the run of play, Pawan received one outside off from Bhatia that sat up. 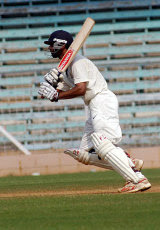 Pawan initially went back but, as he tried to withdraw an angled bat, he played on to his off stump. He scored 56 from 167 balls in 207 minutes, and helped add 131 with Dravid. Sarandeep returned for a second spell - his first saw ten overs for 38 - and should have had Raghu caught but short leg failed to clutch on to a low chance off the pads. Next ball, Raghu got to the pitch and drove four through the covers. He was far more aggressive than Pawan and the singles began to come at a fair clip. Dravid's third six came over his favoured long-on, Sarandeep the bowler to suffer. He moved from 95 to 99 with a pleasing cover drive and at 2.32 on a pleasant afternoon, Dravid reached his second hundred in as many innings, off just 161 balls. It was almost too easy - he knelt down and paddled one from middle and leg to fine leg, ran two, and raised his bat. Dravid's fourth six wasn't timed to perfection - it seemed he was eyeing extra cover rather than left of mid-on - but had enough on it to carry it over the boundary. Arguably his two best shots came in the next two balls: Bhatia pitched fractionally short on the stumps and both times Dravid just went back and pushed boundaries perfectly between midwicket and mid-on. He was out soon after, beaten by a shooter from medium-pacer Vikramjit Malik, who had persevered all day. It pitched marginally outside off and kept very low to sneak under the bat and knock back off stump. For 180 balls and 251 minutes Dravid was a rock, playing good ball and bad with consummate ease, but the poorest of deliveries had him cleaned up. It was a pity there were no more than 50 people there to watch. During an extensive pre-match net session yesterday, Dravid said Karnataka wanted to bat just once and, judging by the platform he's helped build, that may just be the case on an under-prepared track certain to help the spinners as this match progresses. 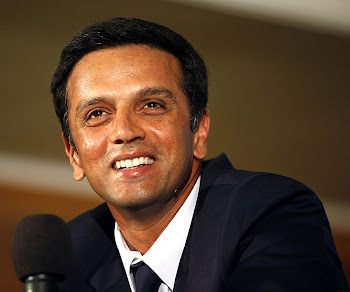 i like Dravid very much from 1997, He is the man i saw with great confidence in his life, God Bless You always & i wish you & your family very long life & full of success in every work you are doing.